Helping you to feel more motivated and inspired when it comes to working from your office. Ensuring that anyone who you do business with takes you more seriously. Creating a place that is separate from the rest of the home to get into “work” mode. Just simply helping to add beauty, richness, and elegance to your home. When you shop the best name for Columbus, Ohio furniture, you will see how easy we make it for you to accomplish all of this and more. You’ll quickly realize that in addition to the home office, we have plenty to offer in furniture for the entire home as well as the outdoors. From there you can begin to personalize the look for your home office by making the selections that appeal to you. You can work with any member of our expert, professional, and courteous staff members to help you decide on things like the type of American hardwood you want to use and even the finish you’d like. Why Amish Originals Furniture Co.? After being in the business for over two decades, we like to think we know a thing or two about the furniture business, especially the best in quality Amish furniture. It also means we have become quite the experts in helping to take care of our customers by offering the best care and service possible. We want each customer experience to be unique and for you to get the level of professional service you deserve. At Amish Originals Furniture Co., we pride ourselves on helping our customers make decisions about their furniture selection. From there the pieces selected are expertly handcrafted on a “built to order” basis. What this means is that each piece of furniture truly is one of a kind and that your own items aren’t even created until you make your selections. 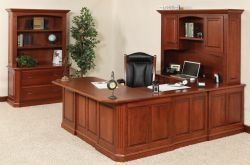 You simply cannot beat the look of the time-honored elegance that quality handmade Amish furniture adds to your home, including the home office. These pieces are also more than just furniture; they become quality family heirlooms worthy of being handed down for generations to come. Stop by and see why we’ve become the number one Columbus, Ohio, office furniture provider for home offices across Northern Ohio and beyond.